There’s a blighted train depot east of downtown Atlanta that’s getting the Hollywood treatment. In an upcoming $100 million mixed-use project, the historic Pullman Yard in the Kirkwood neighborhood will transform from a 27-acre underutilized industrial site into a new “creative city” for the entertainment industry. Spearheaded by the site’s new owner, Atomic Entertainment, the plan involves building a series of lofts, co-working spaces, a boutique hotel, retail, restaurants, and an outdoor concert venue to attract startups and other creatives to the east Atlanta site. A new set of renderings of the Pullman Yard masterplan was recently unveiled, featuring designs by Brooklyn-based studio OCX and Raleigh, North Carolina, firm Hobgood Architects. 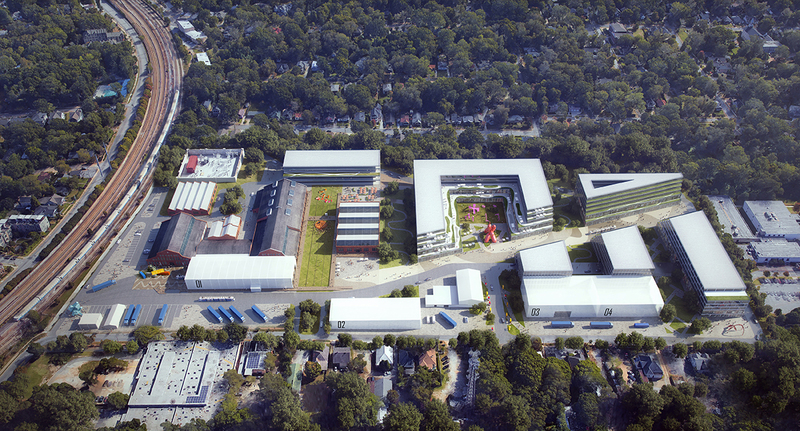 Atomic, led by two Los Angeles-based film producers, aims to turn the 115-year-old former railyard into Atlanta’s newest moviemaking mecca, a pedestrian-centric campus devoted to the city’s $9 billion film and television industry, and its booming music scene. Adam Rosenfelt of Atomic believes the entire project will become a “paradigm for development” going forward. “We’re coming at this from a slightly different perspective as people that work in a collaborative art form,” he said. “This is our first building project, so we’re trying to figure out how to build a mixed-use lot blending the creative and cultural economies of food, entertainment, living, and working, rather than setting up space for the traditional big-box retail economy, which could have easily overtaken this historic area." The site itself is formally known as Pratt-Pullman Yard and encompasses 12 buildings totaling 153,000 square feet. Constructed in 1904 as a sugar and fertilizer processing plant, it eventually developed into a repair facility for railroad sleeper cars, and during World War II, it housed munitions manufacturing. It has most recently served as the backdrop for scenes in futuristic films such as Hunger Games, Divergent, and the critically-acclaimed action movie Baby Driver. In 2009, it was placed on the National Register of Historic Places, though it has suffered from serious neglect for decades. In 2016, it was designated a local landmark. The site’s main facilities, two brick-and-steel, barn-like warehouses, will be renovated under Atomic’s vision as the central architectural focus of the preservation project. The renovation is part of the first phase of construction, now underway, and is led by OCX and local firm Lord Aeck Sargent. The rest of the masterplan, designed in collaboration with Hobgood Architects, includes upgrading other existing structures, constructing new buildings, and integrating a site-specific landscape component by James Corner Field Operations. 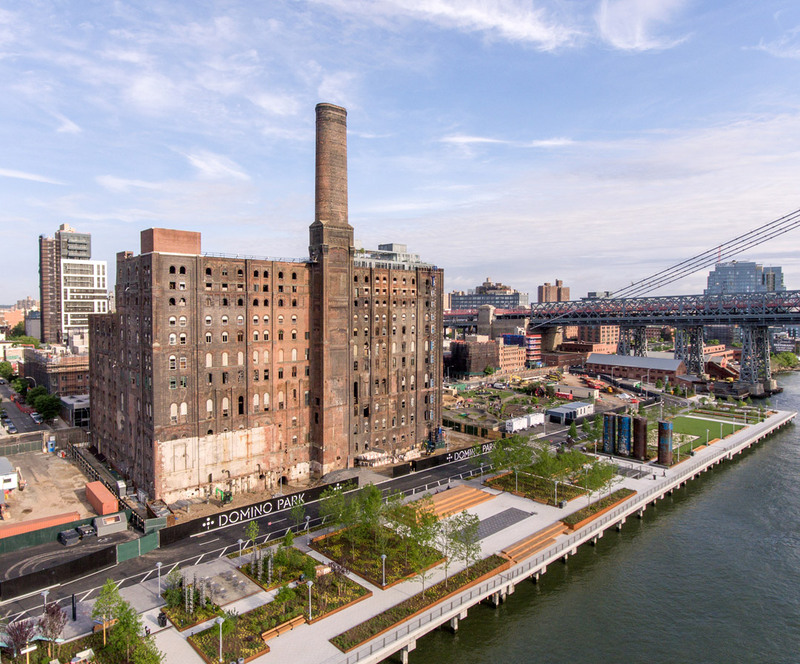 Karen Wagner, principal-in-charge on the project, said Field Operations may use local relics in new ways to preserve the yard’s industrial roots. They’ll also add a new piece of parkland that stretches from the center of the site to the south as a nod to the old railroad delineation. “There’s also a large swath of woodland to the east of Pullman Yard that we’ll connect via existing trails, so overall there’ll be ample greenery and room for exploration and relaxation,” Wagner said. “We won’t, however, propose many trees for the historic core because traditionally, they weren’t there when the yards were built.” Keeping the site’s existing industrial conditions, while simultaneously promoting a verdant outdoor environment means thinking critically about the logistics of jobs that will take place there. 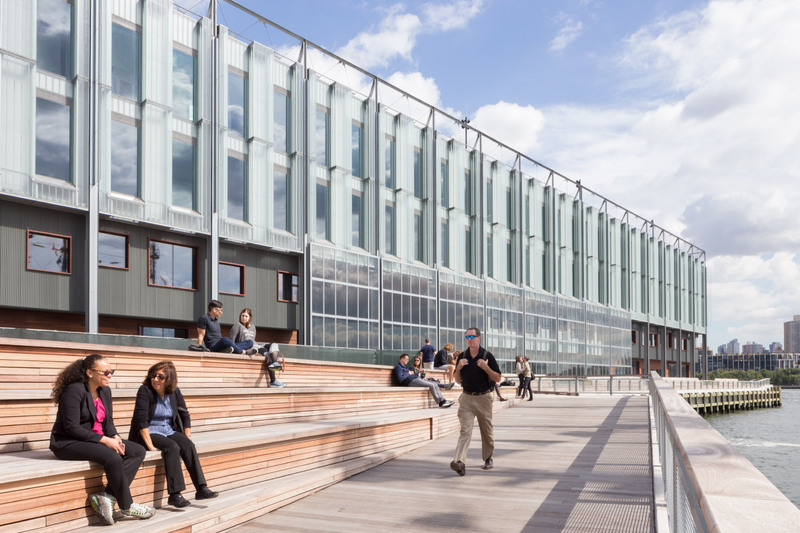 To accommodate pedestrians and trucks coming in and out of the facilities, Luke Willis, principal of OCX, intends to connect all programs on-site via a diagonal axis that cuts through the various building blocks. “This allows us to diversify the building typologies and program use to ultimately contribute to the mixed-use development that Atomic envisions for their creative city.” At the heart of the campus will be the renovated warehouses and a series of soundstages, one of which will be born from an existing 20,000-square-foot steel-clad structure situated near Roger Street, which is the entrance to Pullman Yard, and the rail line leading to downtown Atlanta. 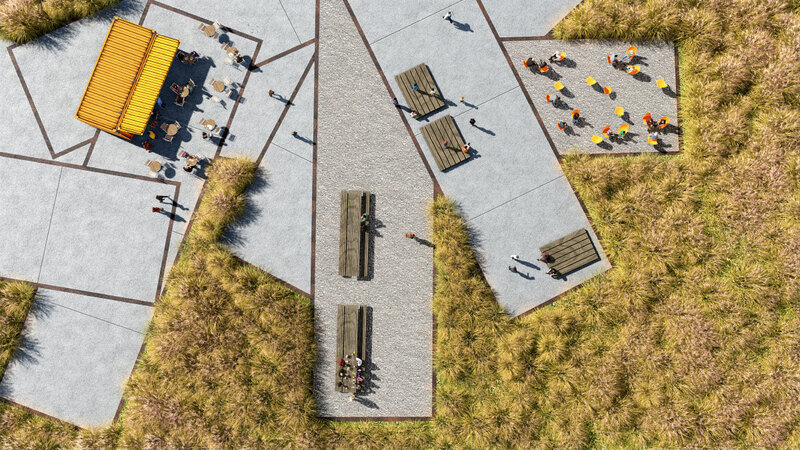 Rethinking these historic structures, among other playful design ploys to attract residents and visitors, will make Pullman Yard both a live-work-play destination and a place that not only showcases its former value with pride but also brings new value to the city today, according to Rosenfelt. An official completion date for Pullman Yard has not yet been revealed, but Atomic hopes to finish the renovation projects by the end of 2020. Bjarke Ingels has gone back to the drawing board and released a revised version of the Oakland Athletics’ potential new home stadium. The new renderings come three weeks after plans surfaced for an aerial gondola that would link the waterfront ballpark at Howard Terminal to the larger Bay Area Rapid Transit (BART) system. 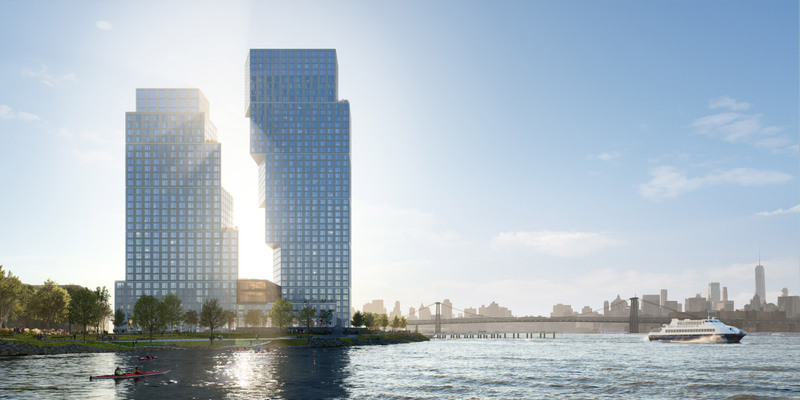 Bjarke Ingels Group (BIG) is working with executive architect Gensler and landscape architect James Corner Field Operations for the site’s green spaces. Rather than a walled-off compound, BIG has envisioned a public-facing, mixed-use “ballpark district” in the vein of Boston’s Fenway Center, or Colorado’s Coors Field–adjacent West Lot. The scheme is projected to bring housing, a business campus, retail, and recreational areas to the waterfront site. The original scheme that BIG unveiled for the stadium last November was centered around a square ballpark topped with an occupiable green “ring” roof. Triangular housing clusters reminiscent of the firm’s Via 57 West would have been positioned at the stadium’s corners, and, judging from the renderings, a playground would have been located en route to the ballpark’s entrance. The diamond-shaped plan received mixed reviews from the public and elected officials. In an open letter sent out Monday, the A’s president Dave Kaval laid out the benefits of the new, softer scheme. 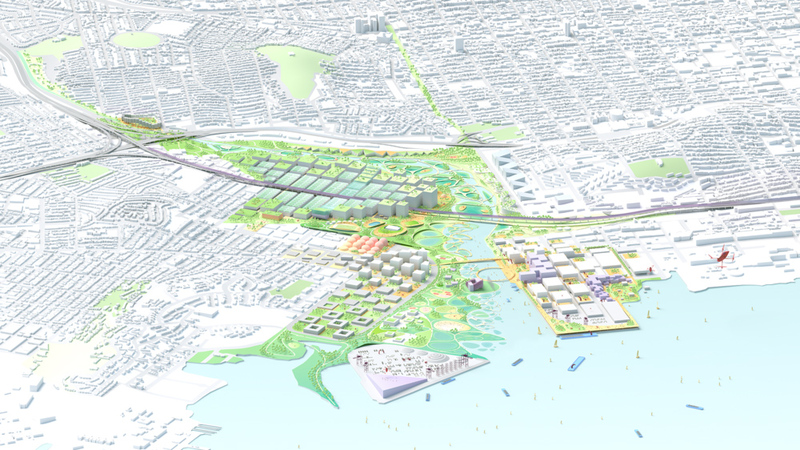 Namely, BIG has opened up views of the nearby waterfront while creating a “softer” approach to the stadium. 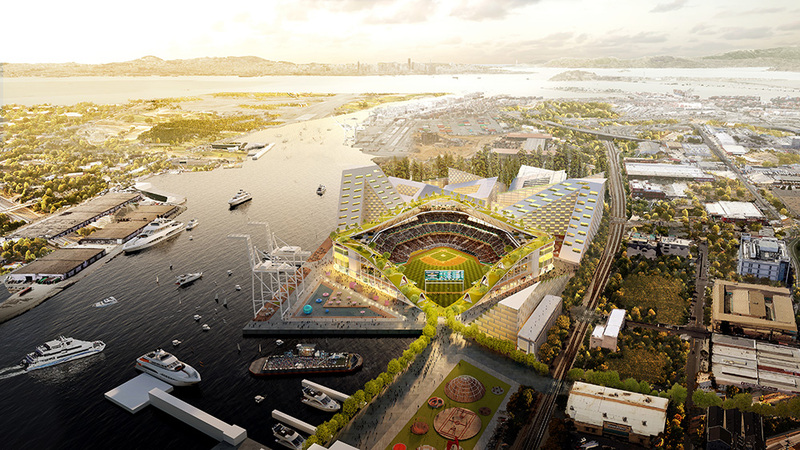 The surrounding towers, some of them up to 20 stories tall, have been reconfigured into more of a “stadium seating” arrangement and would slope down to face both the ballpark and the adjacent waterfront. Though the shape has changed, the airy, striated facade of the 34,000-seat stadium will remain. 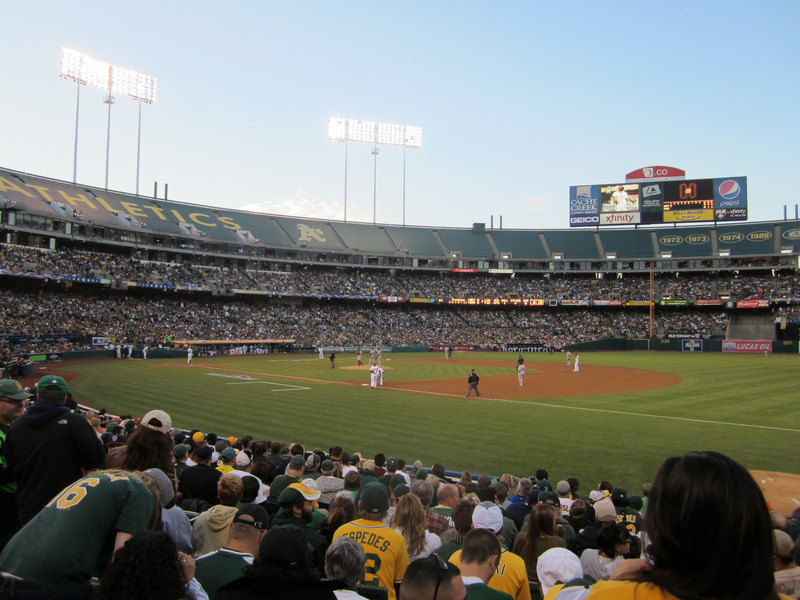 As part of the A’s initiative to build on the site, the team has partnered with the West Oakland Environmental Indicators Project, a local environmental justice group, and will be presenting the West Oakland Environmental Justice bill to the state legislature. 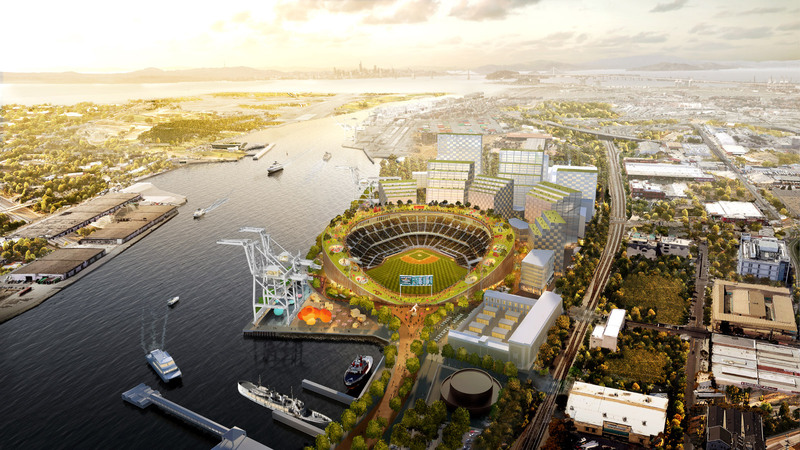 Howard Terminal, the location of the potential stadium, is currently a brownfield site with an industrial past, and soil and groundwater remediation will need to be completed before the A’s can break ground. The team is aiming to begin construction in 2021 and open the park by 2024 but is still working to purchase the site from Alameda County and the city of Oakland. 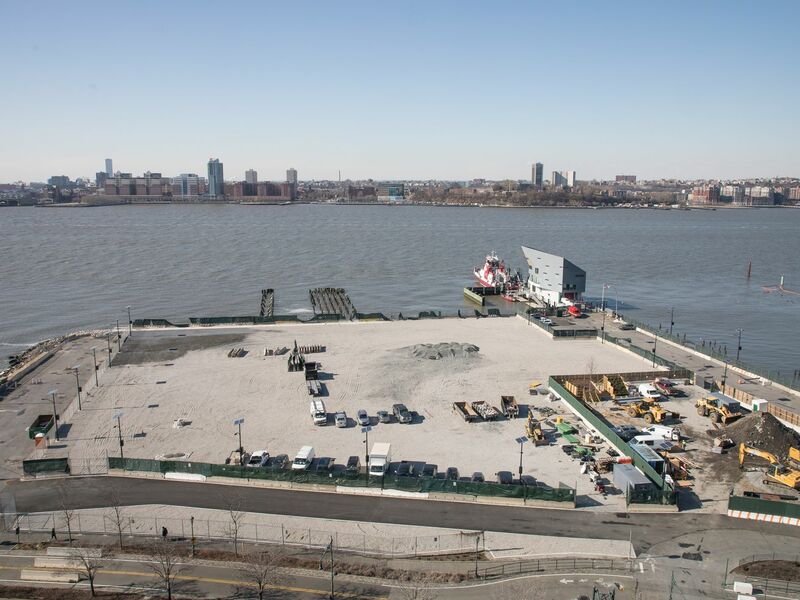 As the waterfront park bounding the massive Domino Sugar Factory development readies for its opening to the public this Sunday, developer Two Trees Management has released photos of the finished esplanade. AN previously toured the site back in April, but the James Corner Field Operations-designed (JCFO) park has finally received its greenery, closed the holes in the pier, and installed the waterworks. As previously reported, the park runs directly in front of the circular, SHoP Architects-designed 325 Kent as well as the string of residential and office buildings master planned by SHoP (and PAU’s forthcoming conversion of the sugar refinery). 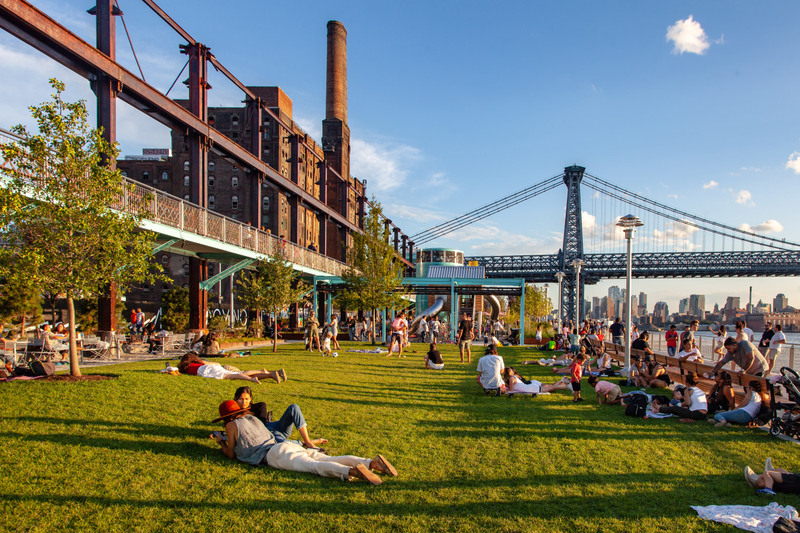 JFCO's take on the Williamsburg waterfront programmatically orders the park so that the more active space is located near the Williamsburg Bridge, and the passive spaces further away. At its most energetic section, the park holds two bocce ball courts, a dog run, a 6,300-square-foot flexible playing field, and a volleyball court, as well as an existing skate park. The vibe mellows as visitors walk further from the bridge, with the Danny Meyer-run Tacocina in front of the picnic area; the taco stand’s patio has been decked out with appropriately technicolor outdoor furniture. An elevated walkway hangs over Tacocina, and park-goers can take in views of the waterfront on a catwalk made from beams scavenged from inside of the nearby refinery. 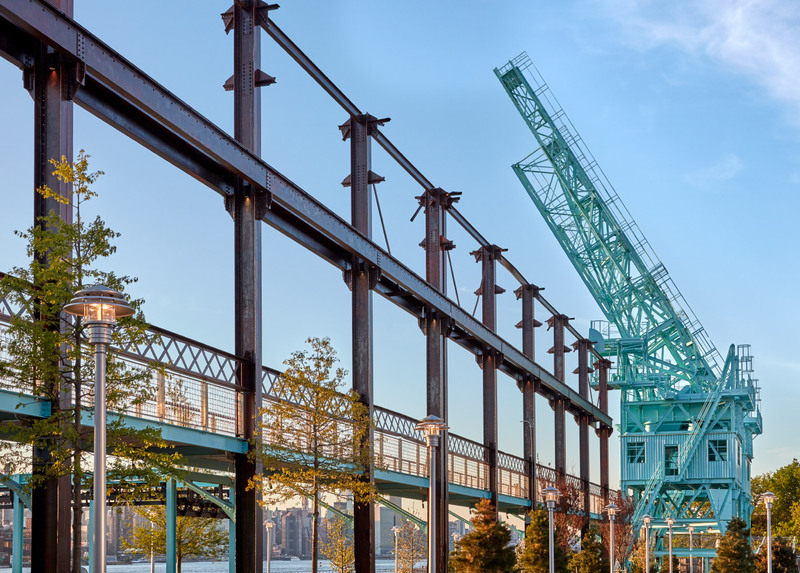 The design is a reference to the site’s industrial past and resembles a gantry–an effect made more realistic by the long-dormant cranes lingering nearby, now painted seafoam green. In fact, industrial artifacts from the Sugar Factory dot the park. Along the five-block-long Artifact Walk, screw conveyors have been installed vertically, mooring bollards, signage, and four 36-foot-tall syrup tanks have all been turned into public sculptures. Even the children’s playground, while new, has been shaped like refining machinery. While the park is owned by Two Trees, it’s been opened to the public and subject to the New York City Parks Department’s maintenance standards. Interested visitors can walk the waterfront, run through the misting sprinklers, or eat tacos on the newly-elevated pier come June 10.